General objective of this lecture is to present on Coastal Profile. 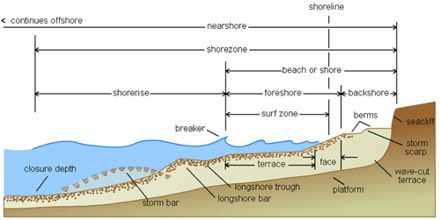 Coastal Profile refers to the offshore, Nearshore, Beach and Coast. The coastal areas, most directly affected by the forces of the sea are the beaches, the gulfs, and the nearshore zone regions that experience the full impact of the sea’s energy. There are two general types of dynamic beach response to wave motion: Response to normal condition and Response to storm condition.